Seriously, how cool would it be to sit down with these two guys and have a beer or dinner and talk about domain names, entrepreneurship, and their experiences. Just an hour with these two guys would be like a full advanced college course in domaining. I would honestly be taking notes while beer dripped across the pages because, yes, I’m that guy taking notes at a bar on paper – not even on an iPad. Well, guess what? We don’t get an hour. You can still have a beer if you want, that’s your call. But get the most out of the next 15 minutes of your life by watching these two hit on topics such as UDRPs, ICANN and ICA. Thanks to NamePros for antoher great video. [scroll-box]Braden: Nat Cohen, welcome to NamesCon. Nat: Good to be here. Braden: Happy to have you. You’ve come to all of them, right? Nat: I missed the first one. Braden: You missed the first one? Braden: I don’t know if we should even do this interview now. Nat: I’ve just been doing holiday travel and I was like, “Richard, this is a great conference idea but I’m just not coming out. Braden: You gotta squeeze it in. Nat: I went to the first T.R.A.F.F.I.C one 2004. Braden: Tell us about what you do. You have a massive portfolio. You’ve been doing it a long time. Tell us about how you got started and why you got started, your experience in the domain industry, and who the heck you are. Nat: Okay. Well, I am… Yeah. I’m from DC, grew up in the area, and I got into domains by accident when I was just trying to publish a website and learn about how to register a domain to do it. And then learned about people investing in domains and got curious and looked into what was available, and that’s what I got started on. And I have a… Yeah, have a sort of a generic portfolio since 1997. Braden: And that’s really…that was early on, right? Nat: It was early on but people liked Digimedia and other ones who were there, even earlier, had taken all the good stuff. Braden: But only by a few years. Nat: Doesn’t matter if it’s by…you know if it is one second. You miss it by one second, it’s too late. Braden: Granted. But it’s still early on because only it was, what, mid ’94, ’95? When did it go public? Braden: Because prior to that, you had to be on the inside to get a name. Nat: I think, yeah. I don’t know much about it, but yeah. Braden: So, you’re old school. Nat: Relatively early. And yeah. So, got names through registrations, some drop catching, a lot of purchases along the way, and try to just keep increasing the value of the portfolio and hope, yeah. Hopefully, I’ve done that. Braden: Did you do much in the Dot-bomb at about 2000, 2001 when a lot of these names were expiring that used to be companies? Nat: I actually got distracted in trying to do development and that took my focus out for a couple of years, probably right when like Frank and those guys were catching all the good stuff that was dropping. Braden: Yeah. Frank Schilling really did well that period. Nat: Then, I’m also involved with the ICA on the board level and have that’s been kind of like the main area of focus for me for a lot of years. Braden: Yeah. You spend a lot of time. Braden: The Internet Commerce Association. Braden: I was gonna ask if you had some bad decisions. Nat: Yes. When I was… I had one of the very first UDRPs, I think, on like a dictionary word domain. Braden: Uniform Dispute Resolution Protocol. Nat: Dispute Resolution Procedure/Policy. Policy I think. Nat: Something with a P in it. Yeah. So, that was something they introduced. Braden: And that’s how a company claiming trademark rights goes through ICANN to take a name from the registrant. Nat: Yes. So, if they think that someone is registering a domain to target their trademark, and a lot of people have done that, and that’s a policy that they can use to get the domain transferred to them. And that policy was built for cybersquatting but it’s been expanded and expanded to a lot of investment domains, dictionary word domains. As domain investors, we’re in this tricky situation where we wanna buy domains that companies like, but the issue is that some companies have already liked that name and trademarked it. So, the question is to what extent when you buy this domain are you targeting that trademark that’s there, or are you buying it because it’s got inherent value? And that’s always been the key issue that’s come down. And a lot of the people who are deciding these things are trademark attorneys and they tend to look at it more from the perspective, if the company has a trademark and you don’t, then why are you buying this if you don’t have a trademark? The only possible reason you’d be buying it is to try and target my client who’s got the trademark. Braden: Which is certainly not the case if it’s a generic word. Nat: I mean, some people could buy a generic word to target an existing trademark but, you know, domain investors are buying them because the word has inherent value and it could be of interest to anybody in any company. Braden: Right. Any kind of brand. Nat: Yeah. So, it’s the… This new policy was written in a broad enough way that a lot of investment domains got caught in that net. And it’s implemented in a way that’s kind of trademark…from a trademark focus. And so you get the wrong guy on the panel and he’ll take a look at it and he’ll just won’t…he won’t give too much credence to the view that this domain has inherent value. He’ll think it’s only because of the trademark value. Braden: The panelists are the decision makers through the UDRP process. Braden: So, they represent ICANN and get to make the decision, yeah? Nat: Well, they don’t represent ICANN. Braden: Signed by ICANN? How would you…? Nat: It’s a multi-step process and each step there’s less and less accountability. So, ICANN credits these providers of UDRP who get to administrator the UDRP under no contract at all, and then the UDRP providers get to pick who, pretty much under whatever standards they want, to be UDRP panelists. Some of them have no IP background, apparently. And then they’re set up. Nat: Because their attorneys or lawyers… We don’t know what their criteria are. That’s one of the things. It’s a black box as to how they pick who they’re gonna use as a panelist and they may just not have… Some of their decisions make it pretty clear they don’t have a good understanding of trademark law. So, these are people who are then deciding whether or not you as a domain owner gets to keep your domain name. Braden: And typically, who are these people? So these panelists, you say, a lot of times are lawyers or IP lawyers? Nat: Yeah. I hope almost always they have a legal background. Some of them are retired. Some of them are academics. Actually, maybe not all of them are lawyers but a good chunk of them are active trademark attorneys who represent brand owners as clients in their day job and that’s their perspective. Braden: So the decision makers are on the trademark side of the world. Nat: Many of them are. Braden: So, who’s representing the domain investors? So, who’s understanding that perspective? Is there anybody in the mix? Nat: At the panelist level, very few, I think, have a particular understanding of the domain investment industry. And so, yeah, your… If you just had to do a random draw, the odds are you won’t get somebody. And that’s why most, you know, most people recommend…there’s an option of a three-member panel or a one-member panel. And even though a three-member panel is significantly more expensive, they recommend trying to get three…that it’s better to get three panelists because you gonna have that diversity of perspective and you may just, from the random draw, you may get someone who doesn’t, frankly, doesn’t really have much of a clue or just has a very you know, minority perspective on what’s okay and what’s not okay. Braden: As a domain investor, my name ends up on one of these panels because a trademark owner is trying to take it from me, even though I just have a generic word and they think they have…I’m infringing on their mark, which I’m not, and then the decision makers are trademark lawyers so I’m not gonna be represented. So, how do we fix that problem? Braden: Nat, I come to you for answers. Nat: Well, I can recommend a good restaurant. Nat: So, there’s an ICANN process. ICANN is the overall group charged with implementing this whole domain name system. And so they’re the ones who…through which this UDRP, the domain transfer policy was, you know, released or they’re the ones who created it through their process. And so they’re reviewing it for the very first time. And the ICA, of which we’re both members, is actively involved in that process. We haven’t gotten to the UDRP portion of it yet, and we’re hoping that that process will result in a more balanced…there’s trademark interest and trademark owners have rights but domain owners have rights too, and we’d like to see a little better balance there, a little better protections for trademark owners who aren’t infringing. There’s too much at risk now. Braden: I appreciate the in-depth perspective. I’m gonna give you an opportunity to plug ICA, and then we’re gonna talk about NamesCon. Braden: So, how does someone support ICA? Nat: They support by joining. That’s the usual way. They go to ICA.domains, which is our website, and they can learn a lot about it and there’s a chance to join. And they can read various testimonials as to why they should join there. And I can give a whole pitch about why people should join but I’ll leave that to you. Braden: Well, we’re gonna move on to NamesCon. So, you’ve been in the space a long, long time, 20 plus years? Nat: I’ve tried many different variations and I haven’t settled on anything good yet, but I try and explain, you know, what it means to invest in a domain name. I think the approach I’m taking now is to say that every company that’s on the internet needs a name and there’s a limited pool of good quality names out there and that limited pool is what we call investment quality domains. And that the key thing when somebody has a name is that it can be memorable and you can remember what that name is. And the great thing about existing words is that some people are already familiar with them. If you have some random combination of letters or some made-up word, no one’s ever heard of that, it’s hard for them to remember it. So there’s a lot of value to a company that that when you say their name, people are gonna remember it. That that name has some kind of meaning, then they get the benefit of that meaning being associated with their brand. So, if you have a nice memorable word that has some positive connotation, that’s a beautiful brand and companies who have big visions for their brand and wanna promote it and advertise it and spend a lot of money getting people to remember it, it’s worth a lot of money over their lifetime to get a brand that has those qualities to it. Braden: And hopefully, those big companies come to me. Braden: So, let’s say somebody wants… Somebody says, “That’s interesting. I wanna do that too.” What do they do? Where do they go? How do they get started? Nat: Well, they’re lucky because there’s a tremendous amount of…tremendous number of people in the domain industry who are providing a tremendous amount of useful information for free and are just being very generous with their knowledge. 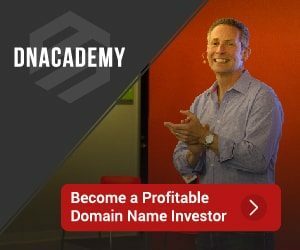 So, there’s sites like domainsherpa.com, blogs like domaininvesting.com, domainnamewire.com, dnjournal.com. I’m leaving out the domainshane.com. Nat: Right. That’s a good…domaining.com. Yeah. You can find all sorts of…many, many of the blogs there. And once you dive in, there’s no end of excellent content and advice that you’ll get. So, I think, once you get started, you’ll get plenty of information there. And of course, come to NamesCon. I’ve said the right thing. Braden: Yeah. That’s where we’re gonna go. Nat: All right. Because this is where everybody is and the people are very generous with their information and there’s tons of sessions, especially geared towards newcomers to the industry that can get them, get you guys up and running and going after the better quality names, steering clear of bad investments. Braden: So NamesCon, we’ve got about 1,300 attendees. It’s pretty good. It’s the most we’ve ever had in any domain conference ever. Braden: Yeah. Because I go to those. Braden: 400 people maybe was the biggest one in Hong Kong. But this is huge. Everyone comes to this conference. It’s a great place to come meet people, network, and all the old school guys like you are here and then people can grab us and talk to us and ask questions. And we’re up on stage and we’re doing panels and there’s a lot of information to be learned here. Nat: Yeah. There’s a lot of valuable information and there’s a number of, you know, there’s some people I’ve talked to over the year and they’re interested in domains. And I say…and a couple of them have come to NamesCon just because it’s like, “This is where I need to be,” and they’re not really domain investors but they have a good quality domain or they wanna learn more and this is the place to come. Braden: Yeah. And they can also… We mentioned blogs. We mentioned NamesCon, and there’s also forums like NamePros. Braden: You haven’t heard it? Nat: Oh, NamePros. Yes, NamePros. That’s a great, great place to go. No, NamePros has done a wonderful job of creating a ton of excellent content, video interviews. Nat: Yes. And my hats are off. Nat: Yeah. My hats are off to the NamePros for stepping up and really creating a ton of valuable information for us. Gary Vaynerchuk is well known as a social media early adopter, successful author of Crush It! , and of course, wine guy at DailyGrape.com but did you realize he knows domains too? I had the opportunity to talk to Gary about his new book, The Thank You Economy and we touched on domaining as well. If you haven’t heard him speak in the past, you’re in for a treat. In addition, I have 5 copies of Gary’s book to give away. Watch the video and leave a comment below to be entered to win one of them. I’ve been working on quite a few video interviews over at MO.com and I love the direction that is taking. There’s nothing like hearing and seeing people talk about their experiences. There is so much more to be gained by seeing as opposed to the written interview. Written interviews are great, and they have their own list of positives. But you don’t always feel the emotion or passion behind the interviewees. My first video interview is with Antonio Centeno of aTailoredSuit.com. A special thanks goes out to Antonio for volunteering to be the first video interview and helping me work through some of the kinks. Let me know what you think.